If you are travelling from Oban, take the CalMac ferry from Oban Ferry Terminal Pier across the Firth of Lorne to Craignure on Mull. It’s a 45 minute crossing so there’s plenty of time to relax and take in the views. From Craignure, hop on a West coast motors bus which will take you across the island to the small picturesque town of Tobermory or Fionnphort with its beautiful white, sandy beach. Your journey through coastal, moorland and mountain scenery will take an hour and ten minutes to Fionnphort or forty minutes to Tobermory. Depending on which tour you have booked you can leave from either Tobermory, Fionnphort and Iona. For further travel information and directions please visit Google maps. Our boat tours are always subject to weather conditions. The Scottish weather is notoriously changeable and even on a sunny day in the height of summer, is not always hot! On land it may be nice and warm but out at sea, with stronger breezes it can get a bit chilly. We suggest you bring the following: warm and waterproof clothing, suncream, sunglasses, hat, gloves, practical footwear (preferably non-slip). If you have binoculars bring them along as there are always interesting things to see which may be some distance from the boat. 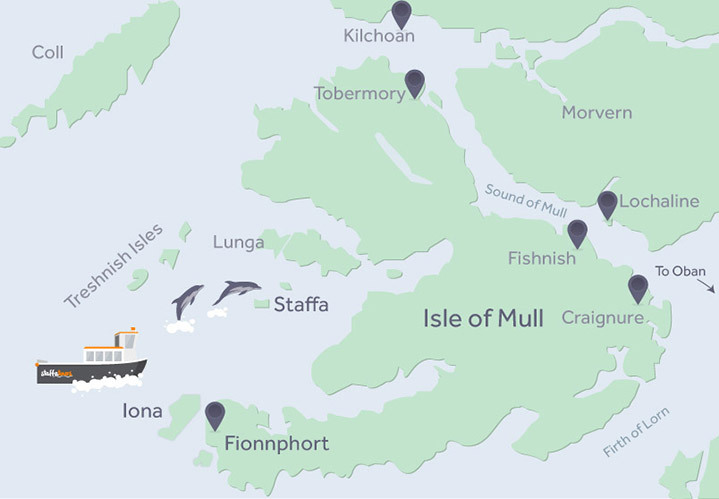 Landings on Staffa and the Treshnish Isles are subject to favourable sea conditions.